In 1900, after producing his last whaleback ore ship, Duluth’s famed shipbuilder Alexander McDougall sold his American Steel Barge facilities along the St. Louis River in Superior to the Superior Ship Building Company. He later set up shop on property he owned on Rice’s Point at 15th Avenue East, the site he originally wanted to build his shipyards (complaints about the potential noise of shipbuilding convinced him to operate out of Superior). As America entered the first world war, the Twin Ports shipbuilding industry blossomed, and McDougall renamed his company McDougall-Duluth Ship Builders, Inc. He then moved his facilities back up the St. Louis River—but this time he stayed in Duluth, building an entire community at Riverside. McDougall’s new shipyard went under construction at the foot of Spring Street along the St. Louis River on August 1, 1917, to build ships for the Allied war effort. It was among the few shipbuilders in the nation that built a nearly complete ship, from hull to engines. More than thirty buildings, including machine shops, a boiler shop, paint shed, and sheet metal shops—as well as three piers—were active in ship production until the war ended. 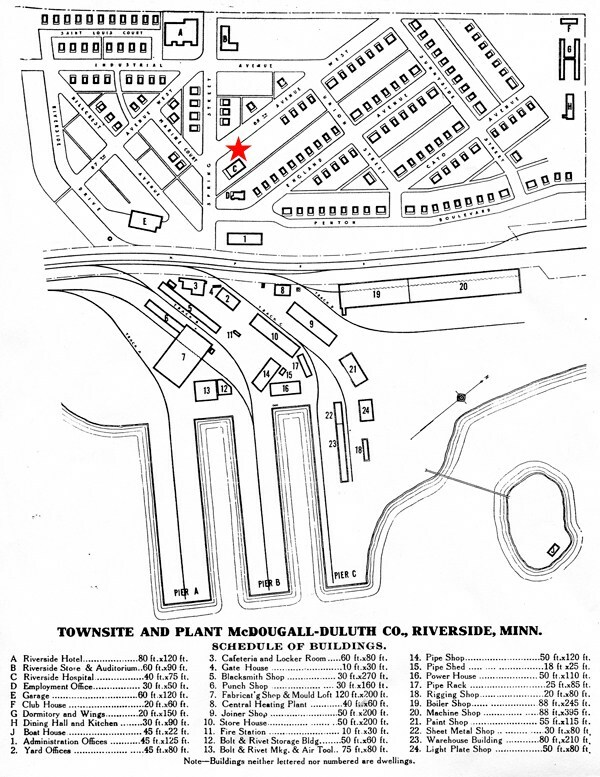 McDougall-Duluth employed 3,500 laborers during and shortly after the war—many of them lived right in Riverside (others lived nearby in Smithville). Like Morgan Park, the town of Riverside developed near the plant for the workers at the facility. The company built fifty cottages overlooking the river, with plans for over 75 more. The neighborhood included a hotel and a grocery and retail store whose upper floor served as a movie theatre and held club and “amusement” rooms. For the single men there was a dormitory that held 250 and a dining hall where they took their meals. Riverside also offered recreation facilities and equipment, including a boat house that held canoes, rowboats and sailboats. A nearby bathing beach nearby was created by the dredging necessary to make the river deep enough for the ships that were to be built there. Because of the dangerous work and the distance to the nearest health-care facility, McDougall-Duluth also built the community a hospital. The two-story building, just 40 x 70 feet, was described as “fireproof” and “completely modern”—and it likely was, as its plans were approved by one of the Mayo brothers of the famed Rochester clinic. It included “two deep sun porches” that overlooked the river. The hospital held four two-bed wards and three private rooms. It was located “in a fine grove of birch and pine on the main street leading to the yard…far enough from the ways of the shops to escape the noise and near enough for quick action in emergency cases.” There was also a waiting room, office, operating room, sterilizing room, kitchen, nurse’s quarters, and a suite of five rooms for the head physician, Dr. Frank Lyman, and his family. 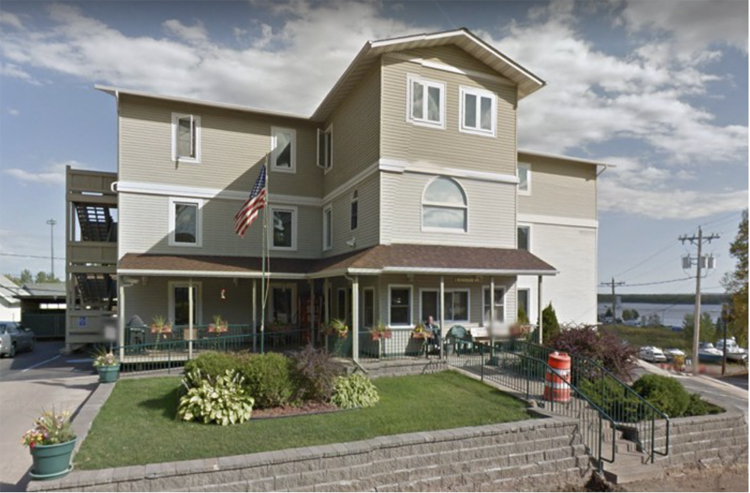 Lyman, from Bar Harbor, Maine, left a private practice he had established in Duluth in 1895, when he first arrived in the Zenith City. In June of 1919 alone Lyman and his staff at Riverside’s hospital took care of over 700 employee patients, most of them suffering from non-life threatening injuries that occurred on the job. Between 1918 and 1922 the facility produced thirty-six 265-foot freighters. (Five of them returned to Duluth as the “Poker Fleet.”) The yards produced ships until 1922, when the U.S. Government stopped buying them. McDougall then retired and the company became Barnes-Duluth with financier Julius Barnes as president—but the shipyards produced nothing. Riverside was no longer a company town, just another Duluth neighborhood. The hospital closed along with the plant and was converted to apartments. Nothing was produced at Riverside for almost another 30 years. But as World War II began, Barnes-Duluth and several other dormant shipyards in Duluth and Superior sprang back to life. In the fall of 1941, workers fought through a “tangle of brush and grass” to get the neglected Riverside shipyards working again. On May 3, 1942, Barnes-Duluth launched its first two ships. At one point they set a pace to deliver a ship every ten days. By July 1943 the yards had produced twelve coastal tankers and were at work on seven oil tankers, which would be at the time the largest ships built on the Great Lakes for ocean service. That same year the facility was purchased by Superior’s Butler Ship Yards. During the war Barnes-Duluth and the other shipyards in Duluth and Superior employed over ten thousand men and women, averaging ten ships a month while producing a fleet of 230 vessels. Butler closed the facility when the war ended in 1945 and sold it to a firm that turned it into a marina. Most of what remained of the Riverside shipbuilding complex was destroyed in 1976. The hospital at Riverside still stands, albeit a story taller than before. Over the years an addition was made to the front of the building and an entire third floor was added. The interior was completely gutted and refurbished. Today the building serves as Garden House Estates, an assisted-living facility for seniors. A story is told about a building right next door to the hospital, once referred to as the “old Captain’s residence.” The building does not appear on McDougall-Duluth’s original plans for the community and supposedly was built with materials stolen from the McDougall shipyard when Riverside was being built in 1917. The building was actually constructed in 1942 as an apartment house, likely to shelter shipyard workers. It is entirely possible that this structure was built from materials found in the shipyard; it is also possible that it was not. In either case, since Barnes-Duluth owned the community, it is unlikely anyone complained about any “stolen” building materials.